As March is women’s history month, this seems an appropriate time to have a look at the gender implications of colour. Curiously, it’s actually a relatively recent phenomenon. Baby books, new baby announcements and cards, gift lists and newspaper articles from the early 1900s indicate that baby-pink was just as likely to be associated with boy babies as with girl babies. It wasn’t really till post-war marketing that pink and blue took their separate gender directions. Nowadays this gendering of colour this is so ingrained in our culture that we take it for granted, and I remember shopping for my baby granddaughters and finding it hard to find any clothes that weren’t divided in this way already (except for very newborn sizes, which were available in white or yellow in case you didn’t know!). Even on newborns the right shades matter, but how much does the colour itself matter, blue or pink? Perhaps in a babygrow it doesn’t, but what as children grow they are learning all the time, directly and indirectly. The Pink Stinks campaign tackles this issue head-on, highlighting toys which reinforce sexist stereotypes – a world where even trusted brands make construction, science and action toys coded blue, where arty and nurturing toys are pink. Hmm, who do you think this toy might be aimed at..? Some toys come in two colours, such as the pink globe that was on sale in the Early Learning Centre. The implication is clearly that girls can’t cope with hard geography unless it is feminised in some way – thank goodness for all the beauty centre and domestic toys reassuringly available in bright pink, because we all know who they are aimed at. How much do these reinforcements from an early age influence how children play? 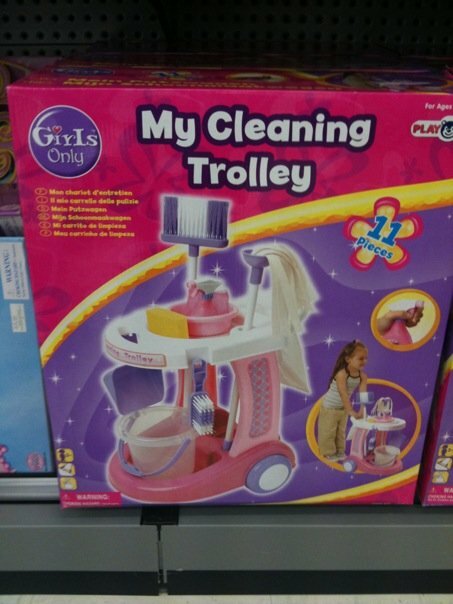 By the time children are playing with others in a pre-school or group environment they have often had these stereotypes reinforced over years, so inevitably girls are drawn to the pretty pink home play area whilst the boys head straight for the trucks and cars. The stereotyping continues on into adulthood too for example Honda has a new lady car called “Fit-She’s” and you guessed it, it’s pink but not too worry it comes in a range of eyeshadow colours too-how thoughtful of them! no doubt it has a built in pink hair-styler too. As an adult choosing presents for children and grandchildren to take to friend’s birthday parties I have found it difficult choosing toys for boys that are not only in blue but unpleasantly violent and aggressive. Looking for creative and artistic toys, it can be difficult finding options that are not overly pink – and the curious thing is that whilst a girl can be different and cross over into wearing or playing with things in blue, boys can never ever have anything pink! Colour should be for everyone to enjoy in its full spectrum of glory. The Pink Stinks campaign aims at restoring the ownership of colour to every boy and girl – and removing the negative stereotyping and role reinforcement that the ‘pink for a girl’. Whilst highlighting horrible items like a cleaning kit in lovely pink and purple or perfume and make up toys for your pre-schooler, the campaign also highlights positive moves like the wonderful ‘A Mighty Girl’ , a collection of books and movies celebrating girls – as leaders, heroes and champions, rather than side-kicks, damsels in distress and love interests. They also share links to bright colourful childrens’ clothes in a range of exciting primary shades – given a choice most small children gravitate toward bright contrasting colours, pastels don’t get a look in (small babies cannot even perceive them, so great for nursery walls maybe but not what children are drawn to). The ‘Pink Stinks Approved’ stamp is a great starting point for anyone seeking gifts and toys for children that won’t start forcing them down a narrow socially-constructed world of politically-acceptable shades. Pink has even infiltrated the proper perception of colour in the spectrum itself. Whether you prefer the acronym Richard Of York Gave Battle In Vain - the phase to remember the visible colour spectrum or my very own Riding On Your Grannies Bike In Venice, there is no ‘P’ in either of those phrases. Pink is not a true colour, it’s simply a dilution of red. Yet, searching recently for accessories and toys for my granddaughter’s “rainbow themed” birthday party, everywhere I looked the rainbows had pink in them! Bunting, ballons table accessories, cupcakes and facepaints… presumably in order to make them acceptable to little girls, they had to have that stripe of pink amongst all the others. By enforcing gender stereotypes in colour we begin the process of distorting natural and spontaneous reactions, and replacing them with complex connotated baggage. This manifests years later in adults not knowing what to wear or what they look and feel good in, unable to tune into their instinctive choices and preferences, needing colour consultants like me to help them rediscover what they are most naturally drawn to. I don’t want my grandchildren to grow up in a world where girls have to like pink & boys have to like blue. Letting children revel in our glorious rainbow existence is surely one of the best gifts of childhood we can bestow - It’s time for change and to stop messing about with young minds by imposing gender stereotypes before they can even learn the words to describe the colour in their world.